Amna Yahya, the mother of the groom, works near the shack where her son now lives with his wife. The ground where the wedding tent once stood was covered with children’s slippers, broken musical instruments, pieces of festive clothing and other detritus of destroyed lives. Teeth, still attached to the jawbone, lay near some tattered decorations. “There is even some flesh left,” said Elan Yahya, the bride’s father, pointing at blackened shards hanging from a tree branch. An airstrike hit the wedding in this remote mountain village on April 23, killing 22 civilians including eight children, and injuring dozens, according to interviews with 17 villagers in late May. More than three years into Yemen’s civil war, over 16,000 civilians have been killed and injured, the vast majority by airstrikes, the U.N. human rights office estimates, adding that the figures are likely to be far higher. The deaths are continuing unabated, with as many as hundreds of casualties per month, despite assurances by a U.S.-backed regional coalition to better protect civilians amid mounting criticism within the United States and the international community. [post_ads]That coalition, led by Saudi Arabia and the United Arab Emirates, is backing Yemen’s exiled government in its conflict against rebels known as the Houthis, who dominate the capital and the north. The United States is playing an essential role in the war, supporting the coalition with intelligence, refueling, technical assistance, and billions of dollars in bombs and other weaponry. The Saudi-led coalition is the only actor in the conflict that uses war planes, mostly American- and British-made fighter jets. The airstrikes have struck hospitals, schools, markets, motels, migrant boats, gas stations, even funeral gatherings, raising questions about the coalition’s ability to abide by humanitarian laws that calls for civilians to be safeguarded. A month after the airstrike in Raqah, the destruction on the ground remained eerily preserved. The lives of the survivors, however, had been forever altered. The growing civilian casualties across Yemen have led to widespread denouncement of the U.S. role and calls in Congress to halt or regulate American weapons sales to Saudi Arabia, a close U.S. ally in the Middle East. Despite the concern, President Trump announced $110 billion in new arms sales last year to the kingdom, weapons that most analysts expect will be used in Yemen. In the hours following the airstrike in Raqah, local media published photos, provided by the Houthis, showing the bomb was a GBU-12 Paveway II precision-guided bomb, manufactured by Raytheon, the Massachusetts-based defense contractor, according to Bellingcat, an investigative website. The Washington Post could not independently verify whether the bomb was used in the attack. But visits to other bombed sites by Amnesty International and Human Rights Watch confirm that American-made munitions, including banned cluster bombs and Paveway bombs, have been used in attacks that have killed and injured civilians. The Post saw remnants of U.S.-made bombs in the capital, Sanaa, and in the southwestern city of Taiz. After the Senate narrowly approved a $510 million first installment of precision-guided munitions to Saudi Arabia last June, the kingdom said it would launch a training program to reduce accidental targeting of civilians. But in the year since that announcement, civilian deaths were 7 percent more than the year prior, U.N. data shows. In April alone, there were 236 civilians killed and 238 injured — the deadliest month this year so far. A U.N. report last month found 1,316 Yemeni children were killed or injured last year, and that more than half of the casualties resulted from airstrikes. A Saudi government official disputed the U.N. figures and said the coalition is “implementing the highest standard measures to prevent civilian casualties,” including “continuous training” of its staff and efforts to improve rules of engagement. The attack on Raqah was still under internal investigation, said the official, who spoke on the condition of anonymity because of the issue’s sensitivity. Human rights activists welcome such efforts but say the coalition’s probing of the aftermath of airstrikes remains hollow. “There is no genuine follow-up on their international human rights obligations and their commitment to respecting humanitarian laws,” said Rasha Mohamed, Yemen researcher for Amnesty International. In a Senate Armed Services Committee hearing in March, Gen. Joseph Votel, the head of the Pentagon’s Central Command, said the U.S. military does not track coalition missions using U.S.-refueled warplanes and cannot determine whether the aircraft or U.S. munitions were involved in airstrikes that have killed civilians. Raqah is in a rugged region in the northern Yemeni province of Hajjah. The sprawling village of about 700 residents is about a three-hour drive from the provincial capital, a place so remote that to reach it requires crossing dry river beds and driving up goat paths. The civil war that emerged from the political chaos that followed the 2011 Arab Spring revolts hardly touched the villagers, mostly farmers and herders. Many supported former president Ali Abdullah Saleh, who was ousted in 2012. 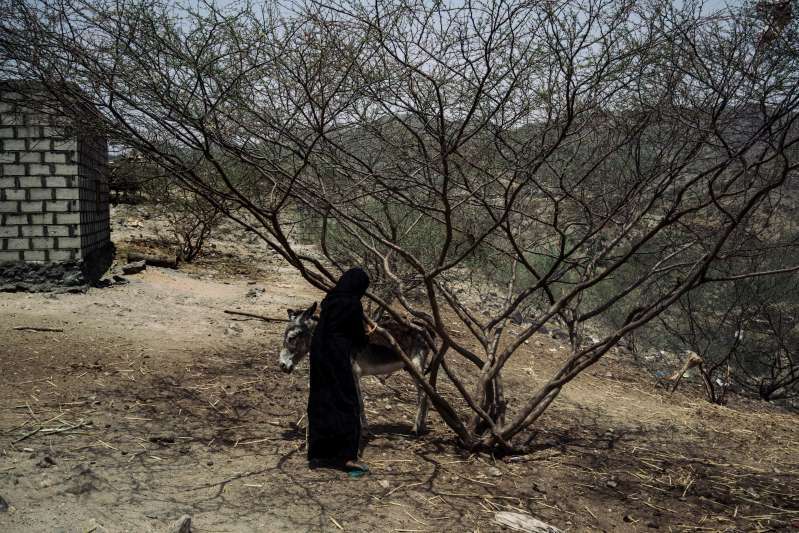 But even after the Houthis swept into Sanaa and pushed out the internationally recognized government, the conflict never came to their area, villagers said. They said they would often see and hear war planes and unmanned drones fly above their huts, but they never felt threatened. They had nothing to do, they said, with the Shiite Houthis or Iran, which is backing the rebels. The Sunni Muslim coalition entered the war to prevent Tehran from gaining a regional foothold through Yemen. Across northern Yemen, rebel checkpoints are ubiquitous. But in and around Raqah, there were none. Nor were there were any visible signs of military activity. Villagers said there were no military bases in the area and none of their men were fighting with the rebels. The only time they had seen rebels in recent memory was the morning after the airstrike, when some Houthis officials arrived to assess the damage. The wedding of Yahya Jaffer and his bride, Fatma, began auspiciously enough. They were both 20 years old, both from the al-Musabi tribe. Like their parents and grandparents, they were marrying within their community. They are cousins. The families had spent much of their savings on the wedding. A large white tent was erected in front of their home. More than 150 guests drank soft drinks and water and feasted on lamb and other delicacies. A group of local folkloric dancers and musicians entertained, according to the recollections of villagers present at the event. Yahya Ahmed not only lost his nephew. His wife, Noora, was four months pregnant. When she heard the bombing, she started screaming uncontrollably. The next morning, she had a miscarriage, he said. Other women and children in the village report having nightmares where they relive the bombing. One woman was in such shock that she feared leaving her bed. Whenever she needed to go to the bathroom, her relatives carried her. Other villagers said they now sleep outside their houses at night out of concern their homes would be targeted by airstrikes. Some villagers have fled to other areas rather than risk being targeted by another airstrike. But the vast majority don’t have that option, including the bride and groom. With their family house destroyed, Jaffer and Allam live in their animal shed, next to cows and goats, their abode reeking of hay and animal urine. They are married in principle but not legally: They can no longer afford to pay for their wedding certificate. So it hasn’t been signed by the local marriage official. On a chair in the shed is the white traditional Yemeni robe that Jaffer wore at his wedding. It is now bloodstained. He has no intention of cleaning it. “I will keep this to always remember what happened,” he said.